A Crusader castle is the latest victim of the Syrian civil war, but the damage to Syrian children may leave a more permanent wound. When some ancient site or remains are damaged by conflict, by the encroachment of habitation or industry, I feel sad at what may be lost. I felt sad when I heard about the looting of the museum in Bagdad, and a few days ago when I became aware that the Crusader castle of Krak des Chevaliers in Syria had been damaged by an air strike. When I was younger, I had a cavalier attitude that people are replaceable, but ancient remains are not. I no longer value the living less than the memory of the dead. Krak des Chevaliers is bound to crumble away eventually. The damage from this air raid adds to its history, and, given who it was built by and why, it will stand as an even more imposing witness to human violence**. The damage to the more vulnerable bodies of the Syrians in their civil war must be a greater loss for the present, than the loss of the castle might be for the future. I can’t help wondering if the longest lasting damage of all is that being inflicted on the psyches of the children who will survive the conflict. In my experience, the younger a child is who experiences trauma, the deeper will be the effects on the adult. That adult will pass on some of that trauma to the world through his or her life, and in turn often will pass on some to his or her children. And so the poison flows down through generations. Through years of therapy I have striven to stem the flow of some damage I received in childhood, damage that must be mild in comparison to what many Syrian children are receiving today. As long as we permit such violence to be done to the young, its poison will continue to accumulate in our societies, and violence will beget violence. Early prevention is easier and more effective than later attempts at a cure. 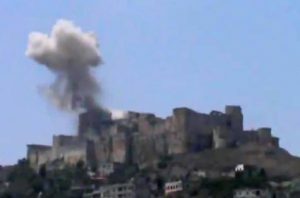 *An image grab taken from a video uploaded on Youtube on July 12, 2013 shows smoke billowing from the Crusader castle Krak des Chevaliers after allegedly being shelled by government forces in Syria’s central Homs province.